Accommodates 8-9 guests in 4 spacious and luxurious cabins, all with (4) en suite bathrooms. - 1 Master cabin (aft-full beam) exceptionally spacious with two large side windows offering fantastic sea views, a small dinette, a large desk, open wardrobe area with mirror, drawers, closet and an impressively spacious en suite (full beam) bathroom with a large bath tub, two spacious marble sinks and ample storage space. Master Bed dimensions: 1.57 x 1.87cm. - 1 spacious Twin cabin with 2 single beds, convertible** to a Double cabin with one large double bed (1,74 x 1,90cm) and en suite bathroom with shower. This bed can sleep up to 3 kids (or 1 adult + 2 kids). - 1 Twin cabin with L shaped beds and en suite bathroom with shower, used also as day head (2 doors). 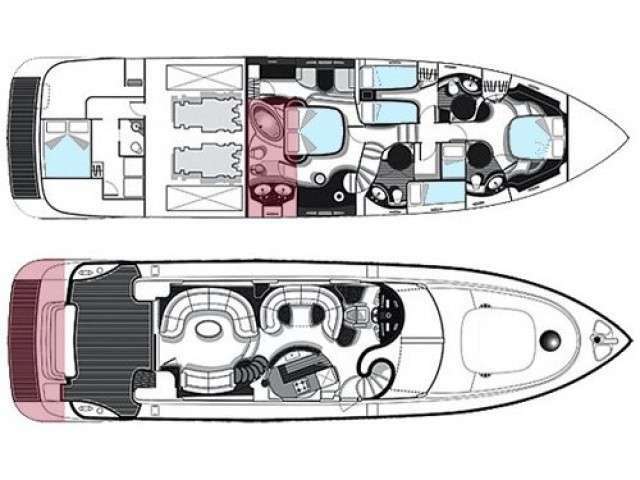 Crew cabin with independent aft entrance and en suite bathroom. * For Sleeping AND Cruising CHILL OUT is licensed for max 12 persons INCLUDING Crew: Either 10 guests + 2 Crew, or 9 guests + 3 Crew. * 9 guests can sleep only if 3 guests share the large Double bed of the Twin cabin, when it is converted. * Under special agreement, on request prior to booking.